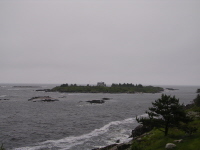 The passage that follows is a log of our Bailey Island, Maine vacation for one week. We have had a busy and stressful year and my wife booked this cottage on the coast of Maine this past January. So here is our day-by-day description of how our vacation went, where we ate, what we did, and more. If you are planning a trip to Bailey Island then perhaps some of the info that follows will be useful. Saturday. We arrived on Saturday evening around 5:00 pm. The cottage that we stayed in was wonderful. See the following link to view the cottage online - Bailey Island Cottage. 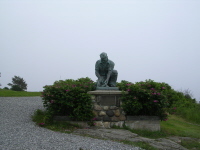 It is located at the water’s edge on the southeastern tip of Bailey Island. It was private and secluded. No traffic and just the sound of the ocean waves crashing against the rocks. We did hear the occasional sea gull and lobster boat passing by. We had a marvelous view of the rocky coast and small islands – to include Jaquich Island. The weather started off cloudy and raining. This was the third week in a row for Maine. Once in a while we get a real rainy summer and this is shaping up to be one of those. Fortunately we brought lots of books to read. The cottage had everything we needed to prepare meals and we brought plenty of food. Saturday night was a spaghetti dinner and red wine in the cabin. Sunday. In the morning we visited Land’s End Gift Shop. The gift shop was a short walk from our cottage so we took the obligatory visit to the gift shop just to check it out. It is actually very nice and has a wide range of gifts with a Maine theme to purchase. Prices seemed reasonable. I didn’t buy anything, but of course, my wife . . . well, never mind. We did get some super fudge. This shop is located at the end of Route 24 at the very south end of Bailey Island. It is worth driving down for the view. There are very few public access locations for someone driving onto Bailey Island (who isn’t renting for a day or week) to actually see the shoreline. Much of it is private property. So this is one of the stops that give you a view for free. Sunday evening we went out to eat at Cooks Lobster House at the northern tip of Bailey Island. The restaurant is located on the water adjacent to a small marina. The restaurant has super views of the water – especially of Will’s Gut (the waters between Orr’s and Bailey Island and the Cribstone Bridge that connects the two islands). The service was great, food was okay, but the bill was a bit pricy (I guess it was the atmosphere that we were paying for). Monday. During the morning and early afternoon we occupied ourselves with reading and watching the lobster boats just off shore. Monday was another rainy day. Later in the afternoon we toured Orr’s Island and Harpswell (south part of the neck) by auto. We saw Estes Restaurant at the end of Route 123 but didn’t stop. Instead we ate at the Dolphin Restaurant and Marina located at the end of Basin Point. The Dolphin is a wonderful little restaurant with good service, good meals, and wonderful views. It is co-located with a marina so you get the view of the water, lobster boats, and the occasional yacht. You can see a lot of islands from the Dolphin and I asked the waitress what the names were and she knew. Good tip there! Of interest to me was that you could see Eagle Island from this vantage point and the waitress pointed that out to me. Eagle Island is where Admiral Perry (famous arctic explorer) retired to. Returning home from the restaurant we took a detour and drove down to Lookout Point on the western edge of Harpswell Neck. 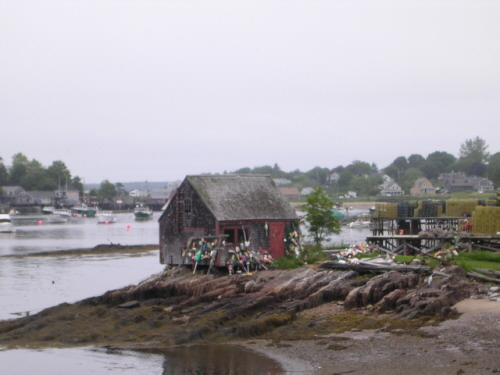 This is also a view worth seeing with a marina, small snack shop, and the Harpswell Inn all located here. Tuesday. We woke up to Tuesday morning with more of the same cloudy and drizzly weather. Our morning was occupied with reading at the kitchen table that overlooked the waters edge. 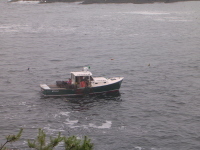 Several lobster boats, big and small, were busy at work right off shore. Lunch was sandwiches in the cabin. We went and visited Mackerel Cove once again. 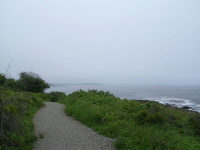 This was one of our favorite parts of Bailey Island and we especially enjoyed the open space afforded by the Johnson Field Preserve located at the head of Mackerel Cove. A pleasant surprise was our discovery of the Giant’s Stairs Trail along the eastern edge of Bailey Island. Although only 1/3 of a mile long it was very scenic and well-maintained. See Giant’s Stairs Trail for more info. We finally found the Cedar Beach area. 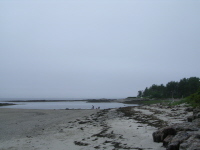 Although it seems to be the biggest beach on Bailey Island it is extremely difficult to find (no signs) and even harder to get to. There is no parking and you feel as though you are walking (it is a long walk) over rich folks private property to get to it. Access to the beach is via a 1/4 long walk over a private road. It is a very nice beach that is dominated by four very nice houses owned by folks with more money than I will ever live to see. I feel there is room for improvement in the matter of public access to scarce natural resources such as ocean front property. I just don’t think the rich deserve 99.9 % of the Maine coastline. But that is just me. We currently contribute every year to the Loon Echo Land Trust Fund in Bridgton, Maine. 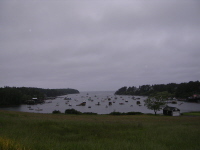 Perhaps we will expand our contributions to the Harpswell Heritage Land Trust - see www.harpswelllandtrust.org. The land trust seems to be doing a fine job in working to conserve and provide public access to Harpswell's natural spaces and shoreline. Later in the evening we ate at the Driftwood Inn & Cottages restaurant. As it is still June and a rainy week at that there were not a lot of diners. The salmon dinner was excellent, reasonably priced, and the atmosphere was fantastic given that the restaurant overlooks The Little Harbor of Bailey Island. They don’t serve alcohol but permitted us to bring in a bottle of Merlot (does that go with Salmon?). Wednesday. Cloudy and drizzly once again. Next year we will rent the same cabin but in the month of August if available. Wednesday was a trip to Cundy's Harbor which is located on the southerneastern tip of Great Sabascodegan Island. A cute little general store and fish food restaurant are located there; in addition to the small commercial harbor. The Holbrook Community Foundation is doing great work in restoring the waterfront for use by the commercial fishing industry. 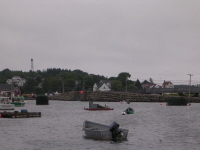 Too much of the Maine traditional waterfront is slowly being replaced by commercial activities that are not unique to being on the water. After visiting the actual harbor we drove around a lot on the side streets looking at the nice homes and took a short trip to Bethel Point. Thursday. More rain. Thursday was a no trip day. We caught up on sleep and did some reading. Got a visit from our daughter and her boyfriend. They enjoyed the cottage for a few hours. We ate in; no visit to a restaurant. I guess Thursday was a "quiet day". Friday. Started out cool and wet but the sun finally came out. In the morning we went for a short ride - saw Mackerel Cove once again and then walked the Giant's Stairs Trail for the second time (this time the sun was out!). In the afternoon we visited the Land's End Gift Shop (a short walk from our cabin) and bought some gift cards (note cards reasonably priced) and some more fudge. They do a nice job keeping the end of the island maintained. It has some good parking and the sights from the grounds of the Lands End gift shop are certainly tremendous. Plenty of benches to sit on and a good job with the landscaping. I don't know if it is the business or the town that does it but it is done well! In the afternoon we sat out on the cottage, watched the lobster boats go by, and drank some beer. A late afternoon snooze and then dinner. Saturday. Saturday morning and check-out time came too soon. We had a great week. We hope our schedule will allow us to come again next year. Time to leave and return to our lives that were put on hold for a week.